Q : Why buy a table from Lyric? A :Lyric is a family run business since 1960. We have an excellent back up service ensuring that the customers needs are always dealt with. With Lyric being a family run business we take pride on delivering the best service to each customer. Q : Do you deliver throughout ireland? A : Yes, we deliver nationwide within Ireland. Q : Do you charge for delivery and if so how much? Q : I have placed an order how long will it take for delivery? A : Lyric have a fleet of six vans to ensure when an order is processed it will take 3 - 10 days for delivery depending on the runs that have been organised. We deliver a number of items to the one area on the same day. Q : How long do you guarantee your products for? A : All new products come with a 12 month guarantee once the product in question has not been misused in any way by the customer. Refurbished products come with a 3 month standard guarantee which can be extended at a very reasonable cost. Please contact us for details. Q : Is it possible to move a table at a later stage if needed? A : Yes, No problem as it takes two people twenty minutes to break down the table in order to move it. Q : What room size is required for a standard size pool table? Q : Is the playing performance the same quality of the pool tables used in snooker halls/bars? A : Absolutely, all of our slate bed tables use the same quality slate, cloth and cushion rubbers ensuring the same playing quality. 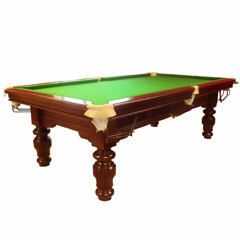 Q : What is meant by slate bed & why is slate used in the manufacture of pool/snooker table beds? A : Slate is used to ensure that the surface will remain level and will never warp. Q : Is it possible to get a pool table upstairs in a house, will it be too heavy for the floor? A : All our tables can be broken down in sections which makes it possible to get the table info hard to reach places. The average pool table weight is between 200 kg and 300 kg which would not be classed as a heavy load for any upstairs floor. Q : What is meant by a free play table? A : By this we mean that these type of tables are designed with no coin mechanism fitted to release the balls. So when using a free play table and the balls are potted they are not held in the table, but are released as they are potted. 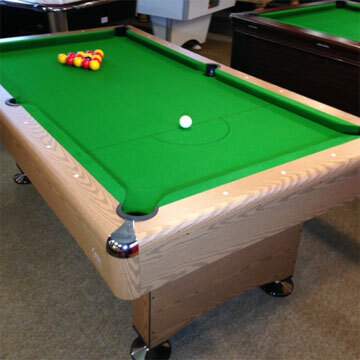 Q : When you say a 7 x 4' Pool Table, is this the measurement of the overall size or is it the playing area of the table? A : The size 7 x 4 is the overall size of the table. The playing area of a 7 x 4' Pool Table is 6 x 3'. 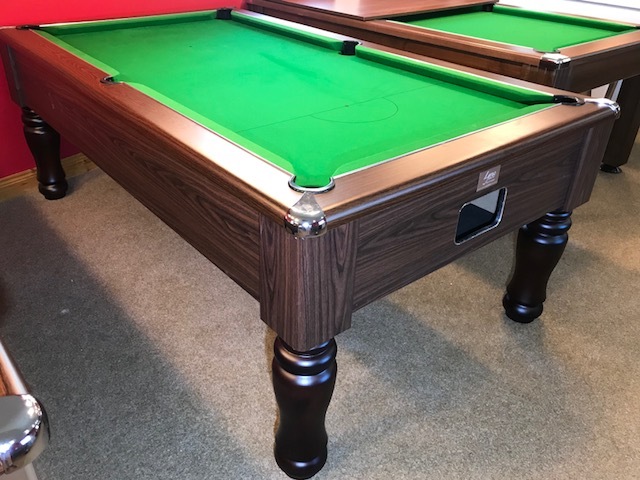 The playing area of a 6 x 3' Pool Table is 5' 6" x 2' 6"